Saves space when not in use. H x W x D: 1880 x 1000 x 1000mm (overall), 270 x 1000 x 1000mm (folded). With a space saving design our folding access platform is not only convenient but it is safe to use for overhead access and maintenance. Designed and manufactured to conform to Health and Safety guidance note PM28 and GN48 standards, they are high quality and reliable to assist you in your job. They are foldable so less storage space is required; however it doesn't compromise on the safety features. There is a kick plate around the base to prevent tools from falling off, slip-resistant floors with drainage holes and anchorage for a safety harness. 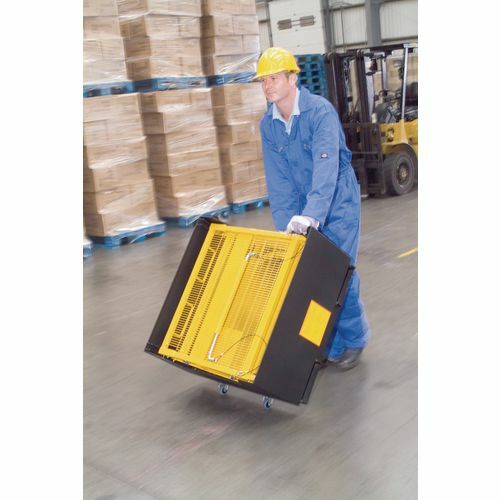 The fork locking system secures the box to the forklift truck while in use, ensuring the safety of the box operator while being raised or lowered. 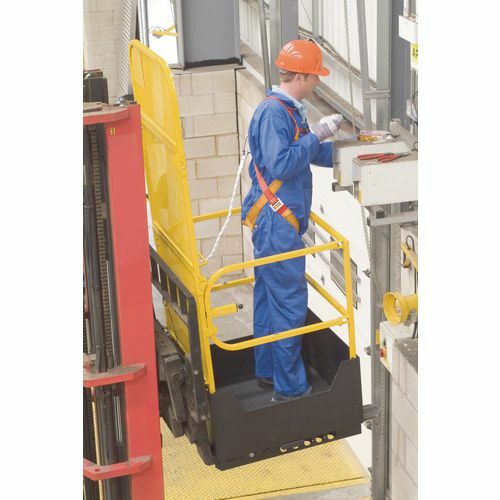 Our folding safety access platform is a great product that can be stored out of the way and wheels to give them mobility - they have a 12 month guarantee and FREE Delivery.